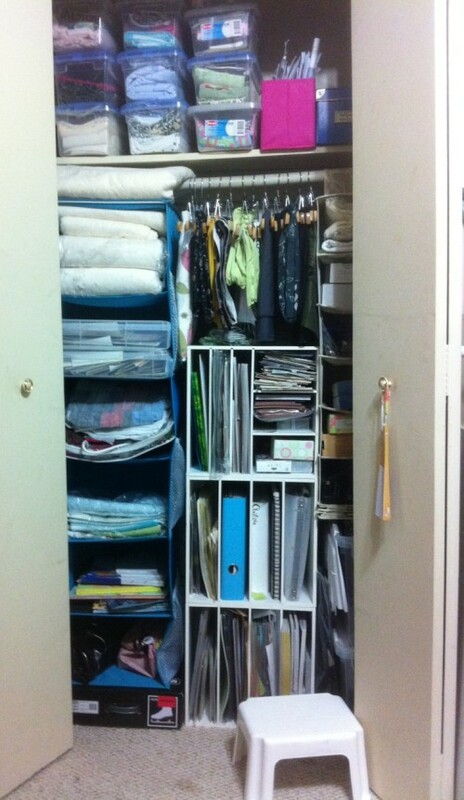 I’ve always dreamed of having a super organized yet gorgeously airy closet, the type that is featured in magazines. My closet is small yet utilitarian. 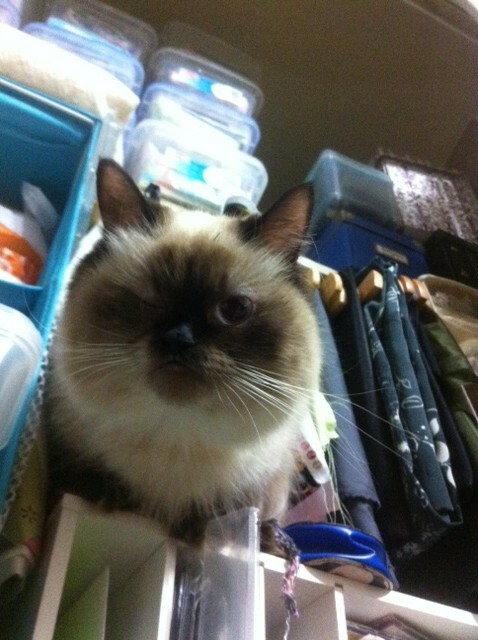 Though my closet is ugly and will never win a style award, every item is in its place. 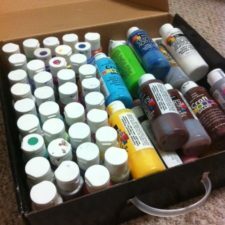 This article is a brief overview of the organization techniques I used in my closet; hopefully some of my techniques will inspire you! Clear bins allow you to easily see what is inside each bin. The bulk of my craft supplies is fabric. I just can’t get enough. 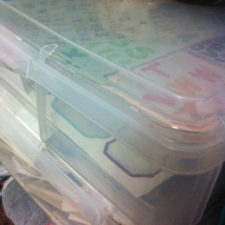 Along the top shelf of my closet, I have stackable clear plastic bins. 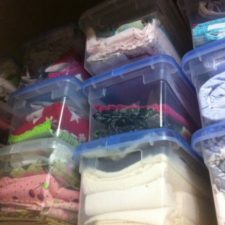 I sort my quilting fabrics by colour for the most part, but I have a few bins with miscellaneous remnants or batting cut-offs. 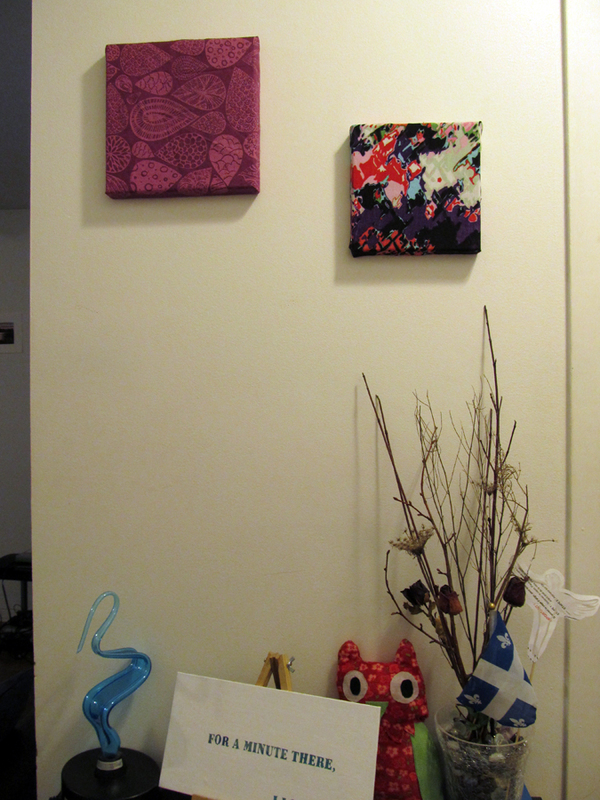 I use a folded-sweater storage shelving as additional storage along the left-hand side for cotton batting, in-progress quilts, and other sewing projects on-the-go. If the in-progress area becomes too overbearing, that’s a signal to myself to stop being lazy and finish up some of these projects. Skirt/pant hangers allow you to easily flip through your fabric collection using the poles in your closet. 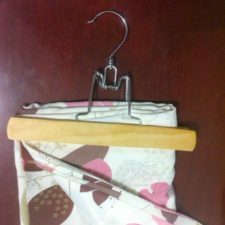 I use skirt hangers to hold my limited supply of fashion fabric on the clothes rod for easy viewing. I store some of my in-progress quilts in freezer bags or the plastic zippered bags that new duvets and comforters come in. I always keep these useful, sturdy bags whenever I buy/receive a new blanket. Michaels also sells great stackable clear locking bins that perfectly fit 12×12 paper. I keep a few of these in the sweater shelf to keep all my alphabet stickers separate from the rest. 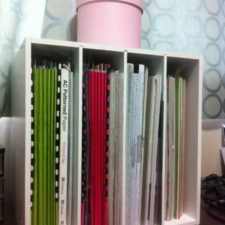 I use these stacking organization cubes inside and outside of my craft room closet. These plastic stacking organizers are designed for 12×12″ scrapbooking paper, but I use one for alphabet stickers and one for general purpose stickers. I love shoe organizers because of their many pockets. I have a shoe organizer running down the right-hand side of the closet that holds small objects and office supplies. Shoe organizers are versatile since they are made out of fabric; I didn’t need mine to be as long as it was, but unused pockets simply fold up. In the far-reaching sides of the closet, I stack large plastic bins filled with rarely used items. Shorties in the room? Standing at 5’1″, reaching the top shelf is inconvenient. 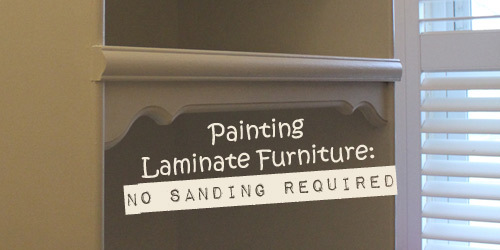 Make sure to keep a footstool handy! 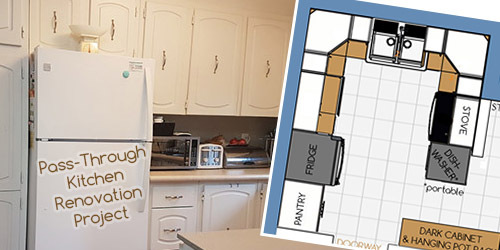 Don’t forget to leave space for new supplies that may come into your life…or for the furry friend who likes to hang out in the closet, just because she can. What are your closet dreams made of?